If you want to go high-end luxury on grooming products, there are plenty out there to choose from and I’ve written about a lot of them, but if you want to try a drug store brand that stands front and center with the big guns, you can’t beat AXE hair products for quality/price/attraction ratio. AXE hair products smell good too. Being the follicle-challenged grooming guy that I am, when I get hair styling products I make the 911 calls to my “hair product testers” to test-drive the concoctions. And these guys have HAIR, lots of it and are picky about products they use. The good news is that all of the reviews have come back with high approval ratings. • AXE Clean-Cut Look Pomade gives guys a polished look without appearing wet for that Don Draper Mad Men look. Perfect for a dandy too. All products have a nice scent that stays close to the body — they definitely passed the sniff test. On a personal note, I’m really digging AXE Deep Clean Shampoo & Scrub. It's surprisingly mild and does a nice job exfoliating and removing scalp build-up without drying the skin. Thumbs up. 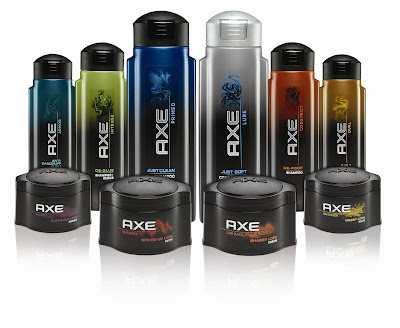 AXE Hair products are available at most food and drug stores. You can also check out the full line of AXE hair products including shampoos and styling stuff HERE! If you have any questions about AXE hair products, send them to Carly from AXE — just follow her on Twitter at @CarlywithAXE. She's great!